Republican Mitt Romney is trying to head off a new distraction for his campaign after a video surfaced showing him telling wealthy donors that 47 percent of all Americans “believe they are victims” entitled to help from the government that permeates their lives. Obama’s campaign pounced on the video, which was obtained by the magazine Mother Jones and released only hours after Romney’s campaign outlined a new strategy to try to rejuvenate a struggling campaign. The video’s emergence came as advisers to the former Massachusetts governor tried to reassure party leaders and donors about Romney’s strategy amid concerns that the race could be slipping away. In a 7-minute news conference with reporters before a fundraiser near Los Angeles, Romney did not dispute the authenticity of the hidden-camera footage, but he called for the release of the full video, instead of just the clips posted online. He sought to clarify his remarks but did not apologize when a reporter asked if he was concerned that he may have offended people. About 46 percent of Americans owed no federal income tax in 2011, although many of them paid other forms of taxes. More than 16 million elderly Americans avoid federal income taxes solely because of tax breaks that apply only to seniors, according to the nonpartisan Tax Policy Center. Real estate magnate Donald Trump, a Romney campaign surrogate, said he thought the former Massachusetts governor should he he’s sorry for his remarks. 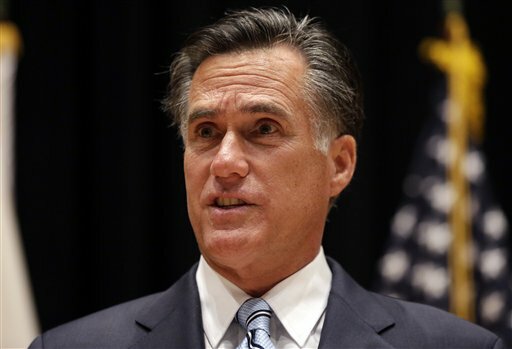 The video was the latest headache for Romney’s campaign, which has tried to focus attention on a weak economic recovery and make the case that the Republican’s business background would help spur the economy. In recent weeks, it has dealt with the fallout from Clint Eastwood’s rambling conversation with a chair at the Republican convention and Romney’s omission of the war in Afghanistan or thanks to the troops in his primetime convention speech. The eruption of violence in Egypt and Libya last week prompted Romney to issue a statement assailing the Obama administration before it was known that an American ambassador and three other U.S. citizens had died in Libya, a move that generated criticism from Democrats and Republicans alike. A series of polls have shown Obama with an edge nationally and in key battleground states, leading Republicans to implore Romney to give voters more specifics on how he would govern. The new approach aims to improve Romney’s standing in the lead-up to the first presidential debate on Oct. 3. An Obama adviser said the Democratic campaign might use Romney’s comments from the fundraising video in television advertisements. The official wasn’t authorized to discuss campaign strategy publicly and requested anonymity. Romney’s campaign released a separate television ad, arguing that the president’s policies “are making it harder on women.” It cited unemployment and poverty statistics for women in an attempt to close the gender gap that has shown women favoring Obama. Associated Press writers Steve Peoples and Kasie Hunt contributed to this report.